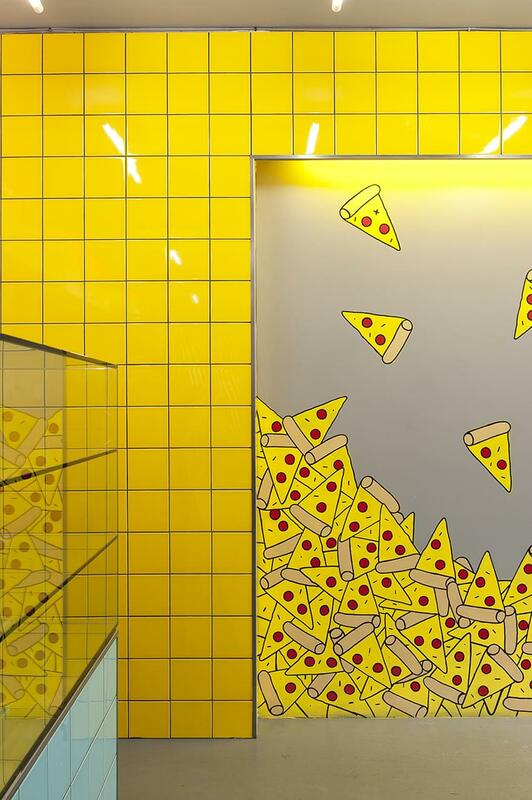 It’s yet another example of the worlds of food, design and architecture colliding as this clever modern adaption of the pizza parlour has forever changed the way people grab a slice. 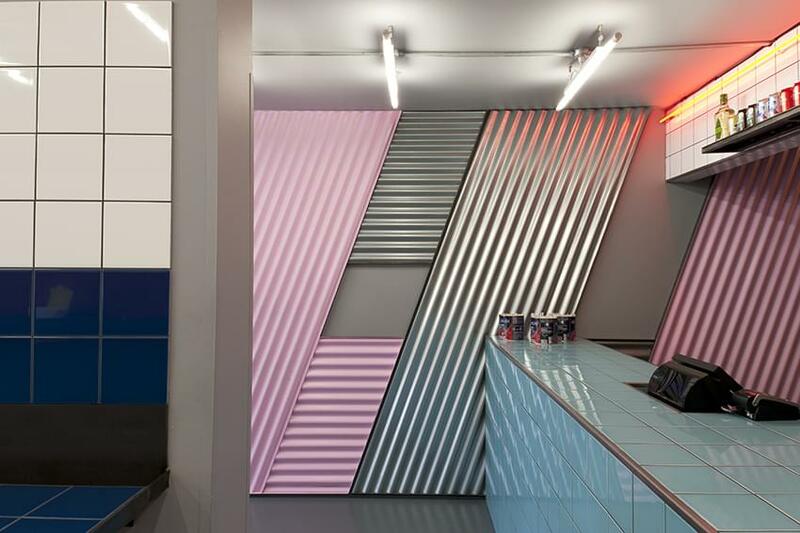 Maybe it didn’t seem possible that this experience could be revolutionized yet a collaboration between Voodoo Ray’s and London based design consultancy firm Brinkworth has done exactly this. The collaborative effort these two entities have come up with is mouth-watering both aesthetically and in taste. In every sense of the word Voodoo Ray’s is iconic. Just as a pizza is modular and has an adaptable form, so does the architecture of this small quirky pizzeria. 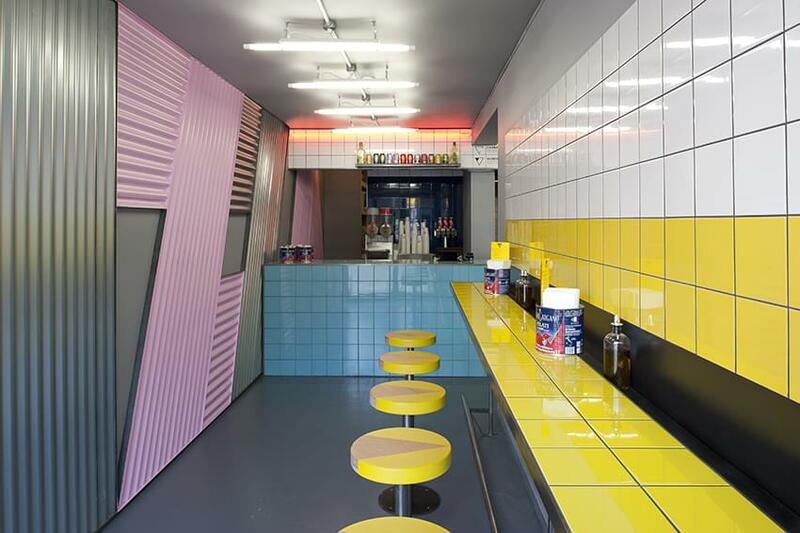 It’s a carefully constructed design, engineered to fit within the bounds of three shipping container units in Shoreditch’s award winning BOXPARK. Even the bold, striking, signage on the front and the fit-out has been modelled around the constraints of a container. 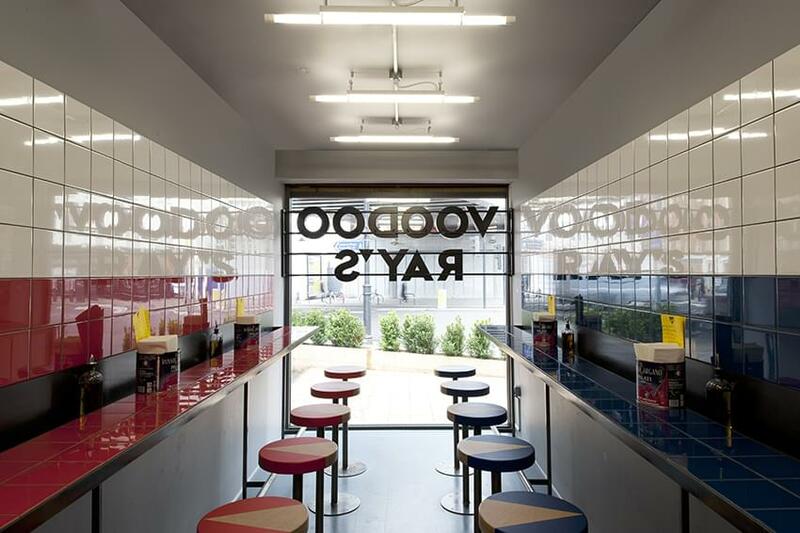 This form of design has a strong contextual importance as it sets a tone that Voodoo Ray’s can be moved and adapted to fit within a wide range of sites all around the world. It so successfully follows suit with a concept explored earlier by The Cool Hunter with the notion of ‘small is the new big’, as were seeing more pop-up stores and adaptive retail. The pizzeria itself has a strong and recognizable interface that is both alluring and a great representation of what Voodoo’s stands for. They don’t appear to take themselves too seriously yet still offer vibrancy and colour; qualities which are consistently mimicked through their branding, menu and design. 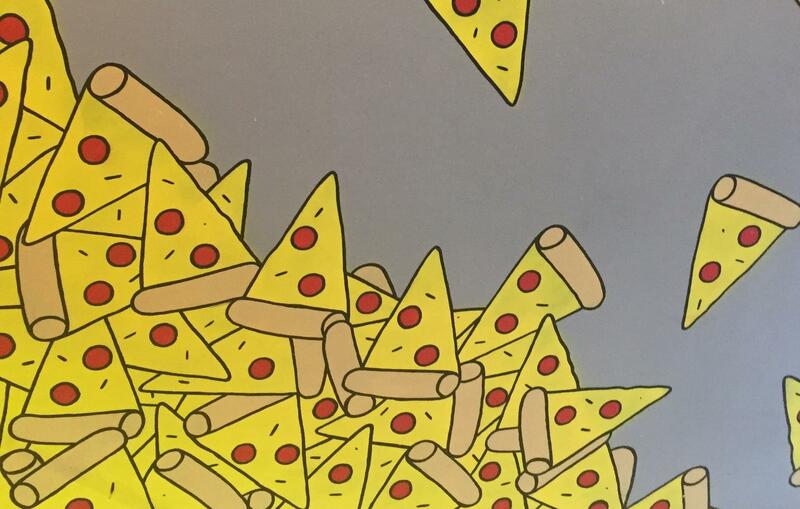 It seems far more than just a slice of pizza, in fact Voodoo’s have found a clever way of making pizza an icon again; something maybe not seen since the days of folding your slice in half whilst you ate it because that’s what the ninja turtles did. Everything has been thought out and the level of detail which has gone into the whole concept is impressive. For instance high bars have been implemented to create a unique bar style eating experience which fits within the modular set up. 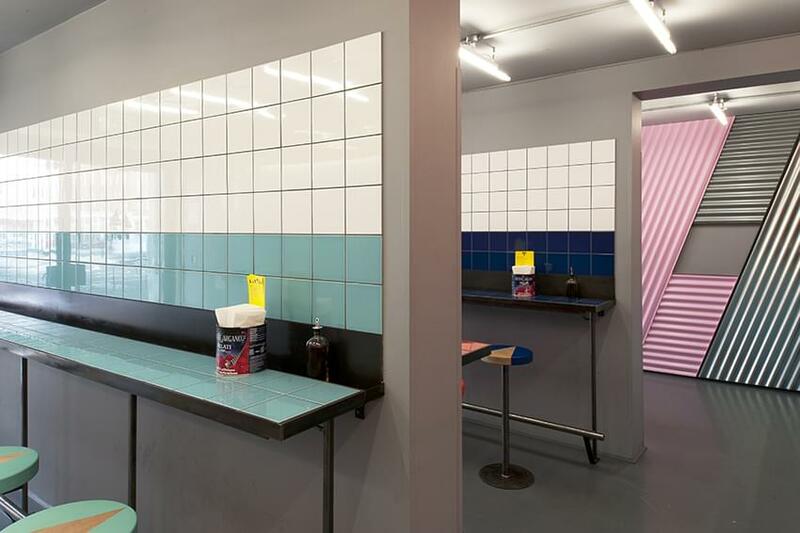 Voodoo’s even has its own dynamic range of coloured tiles which provide a playful vibrancy to the whole scheme and Brinkworth have so carefully implemented materials in their design which pay homage not only to the brand but the shipping container which facilitates this unique concept. It is no surprise that with such amazing design like this Brinkworth has been commissioned by the likes of Nike, Supreme, Ben Sherman, Selfridges, Carhartt WIP, Dabbous, LBi, Dinos Chapman, Converse, Karen Millen, Heineken, Tinello, Rapha, Google and Casio. 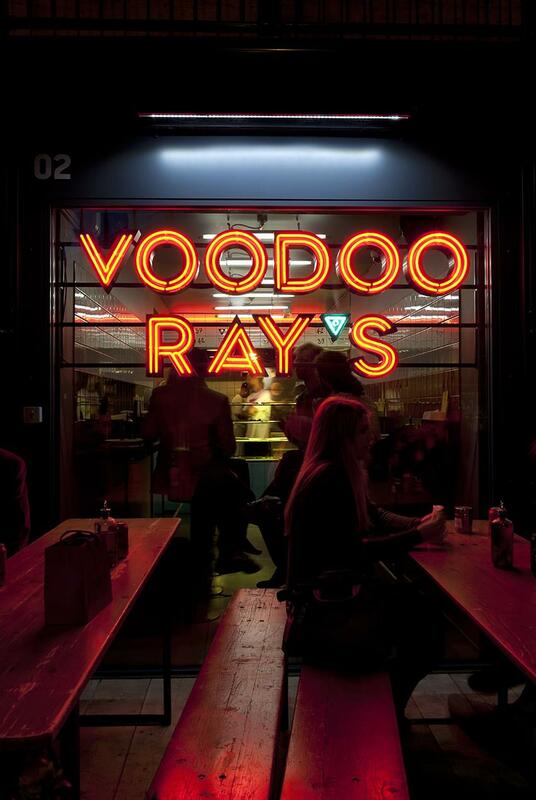 Voodoo Rays are currently in the process of evolving the brand further and locating to more permanent locations in the future. It truly is more than just a slice of pizza, it’s now that cool new place for people to meet and share a love of something so simple yet tasty. – David Mousa.